IDF 2012 Intel has developed a truly digital radio chip, a part that replaces the analog elements in today's radio frequency transmission and reception circuitry with digital equivalents. The result of a ten-year research project, the digital transceiver is a 32nm part capable of delivering Wi-Fi. It's still at the experimental stage: it can only handle 2.4GHz 802.11g, not 802.11n or 5GHz operation, but as a proof of concept it shows what can be achieved. "A lot of engineers and managers Intel said this couldn't be done, that components like digital frequency synthesisers will not work," said Intel CTO Justin Rattner. 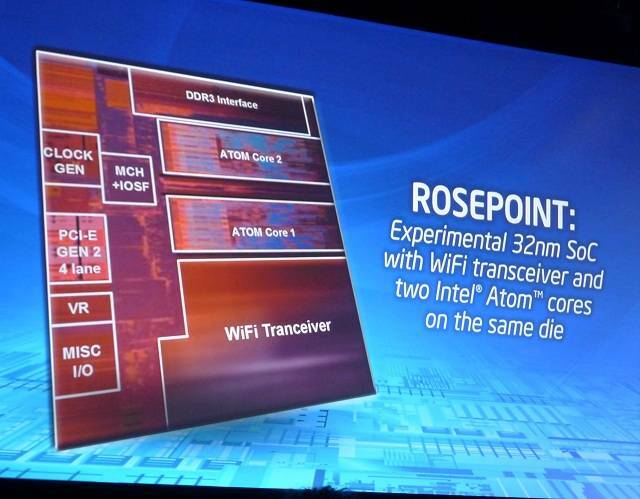 The next stage is to integrate the radio directly into a processor die, and Intel Labs researchers have already working on Rosepoint, an experimental system-on-a-chip that combines an earlier version of the digital radio demo'd today with a pair of Atom CPU cores, memory controller, PCI Express control and other IO, have begun punching out 32nm test wafers. Analog hasn't been totally eliminated - a few components still need to be rendered in analog circuitry. But by replacing the vast majority of analog elements with digital versions, the radio is able to take advantage of silicon process technology in a way analog can't. Intel is working on converting as many of the remaining analog elements as feasible, it said. Digital circuitry scales neatly as chip fabrication processes shrink. That's not the case with analog. In fact, some analog components cease to operate efficiently - or even at all - when they are reduced in size. Elements such a digital frequency synthesisers, phase modulators and ADCs, can shrink from 0.3mm² at 32nm to 0.04mm² at 14nm. That might not matter if devices remain large. Analog radio systems aren't expensive, either. But as more hardware needs to be connected to networks - think of tiny sensors that run for years on a battery charge, streaming data throughout that time, or of wearable devices - that puts a premium on shrinking the radios they must contain. Put radio into the CPU, and any device that processes data can be easily and cheaply internet connected. And existing devices such as smartphones contain multiple radios. Digital RF is key to delivering Bluetooth, Wi-Fi, GSM, 3G HSPA and 4G LTE with a single, tunable radio unit. That will make for better battery life and more compact devices. They will be better radios too, said Rattner. "We think this radio will out-perform best-in-class analog radios because it can automatically adjust for interference and self-callibrate in real time." 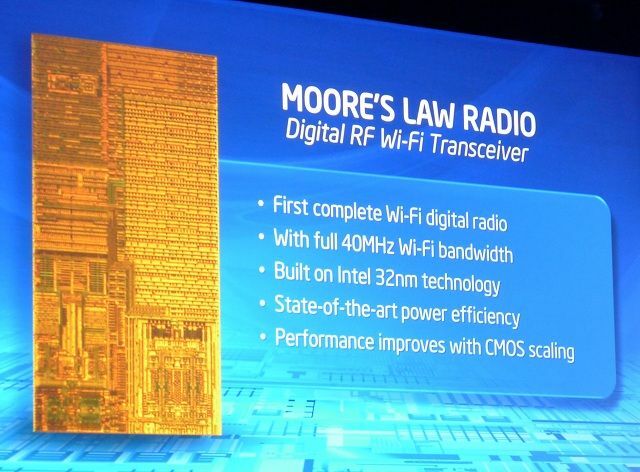 Intel didn't comment on power consumption and other potential disadvantages emerging when the digital radio is compared to analog kit, but Rattner said the efforts behind today's demo chip was focused on "getting it to work", not optimising it for power consumption and such.